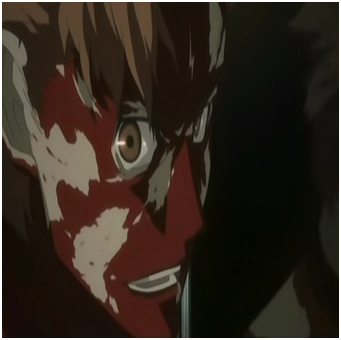 Baccano!, as I’ve discovered, is a well-beloved show often recommended as a gateway watch for people just getting into anime, especially among American fans. Lauded for its boundless energy, larger than life characters, and unconventional narrative style, I gave it a shot and eventually discovered that it indeed has all those stuff. I also discovered I don’t care much about it. 1) what’s up with some of these guys who just can’t die? 2) what happened to the the sad woman’s missing brother? 3) what happened on the train journey? Thing is, there is really not much point in the show’s non-linear narrative: it’s basically nothing more than a gimmick. There’s only a single instance where it does something interesting with the structure: episode 8, in which a certain pair of characters committed the same schtick in three different timelines and circumstances. We’re not talking about something like Rashomon or Memento here, in which the non-linearity is an essential feature both as crucial narrative device and to solidify the themes they’re conveying. Quentin Tarantino’s Pulp Fiction is a pretty apt comparison, at least insofar to the non-linear structure and how there’s not much point in it other than the vague sense of satisfaction once we’ve figured out the chronology. However, PF segmented its narrative in big chunks of mini-stories that just happened to be put in semi-random order, while Baccano! had all these small chunks of timelines going simultaneously and constantly hopped between all of them for no good reason. Honestly, I don’t think the show would lose anything significant by telling its story like a normal person would, and in fact it’d probably help to cut down the momentum kills and a bit of time inevitably needed by the audience to recall what happened last in Timeline B as the show zipped back to it after some development in Timeline A and C.
Even then, the more significant problem for me is that I don’t find the characters nor the dialogue endearing at all. A huge part of why I found Pulp Fiction so re-watchable is, despite the fact that it’s not particularly deep in terms of plot or themes, it’s worth it just to relive its many iconic character-driven moments all over again. 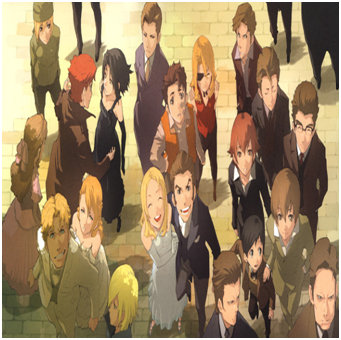 I didn’t get the same urge once I’ve finished Baccano!, to say the least; the characters are either okay-ish but ultimately forgettable people, irritating dorks, nonsensical bastards, and psychopaths that the show clearly wanted us to love (it’s sort of Ryohgo Narita’s thing, apparently). 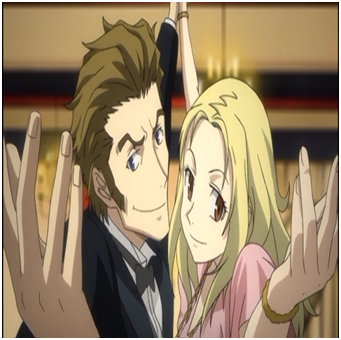 All that said, I still recognized the level of energy and playfulness that made Baccano! so popular and recommend the show for those with certain sensibilities. Fans of 1930s gangster movies might be able to appreciate the setting and atmosphere it’s trying to evoke, while lovers of long-running superhero stories would also find plenty to love, what’s with the cartoonish ultraviolence, people keep coming back from dead, and inconclusive ending (*the show’s explicit encouragement, as conveyed by its two meta narrators, to “cast away the illusion that there’s a beginning and ending of a story” is a pretty cheeky way to lampshade and simultaneously explain away the fact that it’s a partial adaptation that left loose threads all over the place by the end). While it doesn’t amount to much in practice, I at least appreciate its explicit willingness to experiment with narrative structure and the notion of a main character. Just not my cup of tea, I guess. I feel much the same way about Baccano!. I get why it’s so popular and I don’t begrudge the show its myriad of fans, but even though this type of series would ordinarily be one I’d love, the execution just felt incredibly jumbled and messy to me. For what it’s worth, I much prefer Durarara!! to Baccano!. It’s got that same infectious, giddy energy about it but strikes me as a far more watchable title. Yeah, I avoided calling it overrated and tried to articulate my own problems with it instead (*the first draft of this piece is a lot more harsh). This, along with Steins;Gate, is the anime I’m much more lukewarm on compared to the vast majority of fans. I think I’d like Durarara more too, although in general I’m bothered by Narita’s sociopath glorification for some reason. Also, thanks for being the first ever commenter! I probably wouldn’t have enjoyed Steins;Gate anywhere near as much if I hadn’t watched it with friends. I like the series a lot now, but it seemed to take forever to really get going in terms of story – there was a ton of set-up. I think I only started really enjoying it around the halfway mark, which is a definite problem.